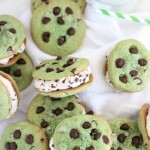 Soft and chewy mint chocolate chip cookie sandwiches with chocolate chip cream cheese buttercream! After dinner last night, I was staring down a full, unopened carton of mint chocolate chip ice cream, and trying not to resist tearing it open. It was my favorite flavor as a kid, and I’m more of a plain and boring vanilla ice cream-person these days (laaaame), but I occasionally get on a kick with mint chocolate chip. We stocked up on ice cream earlier this week, which resulted in these Maple Pecan Blondie Sundae Parfaits, a dessert I’ve been craving and wanting to make since September! A few short days later, and that carton of butter pecan ice cream is long gone, and I’m exercising my will power to resist opening the mint chocolate chip. See, next week is vacation for me, and I’ll be going up north to visit my family in Pennsylvania for the week. I want to splurge and indulge when I’m there. 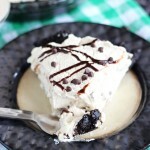 I must sacrifice eating desserts now, so that next week I can eat them guilt-free and carefree. 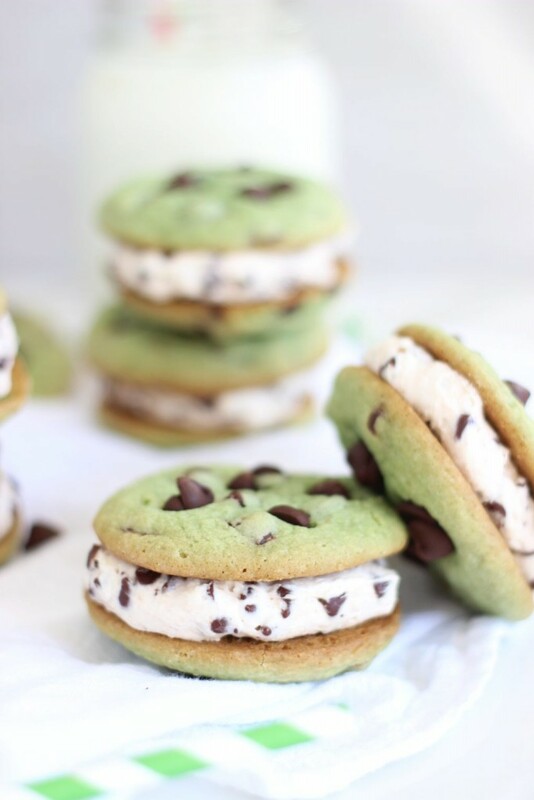 Meanwhile, I’m also staring at a few of these leftover Mint Chocolate Chip Cookie Sandwiches that I stashed in the freezer, and wondering how they would be with a scoop of mint chocolate chip ice cream on top. Doooo it, and report back. I’m not going to do it… yet. But I want to hear all about it, so let me know how it goes. I’m going to stick to my egg whites and oatmeal for now, but when I leave for vacation tomorrow, it’s ON. 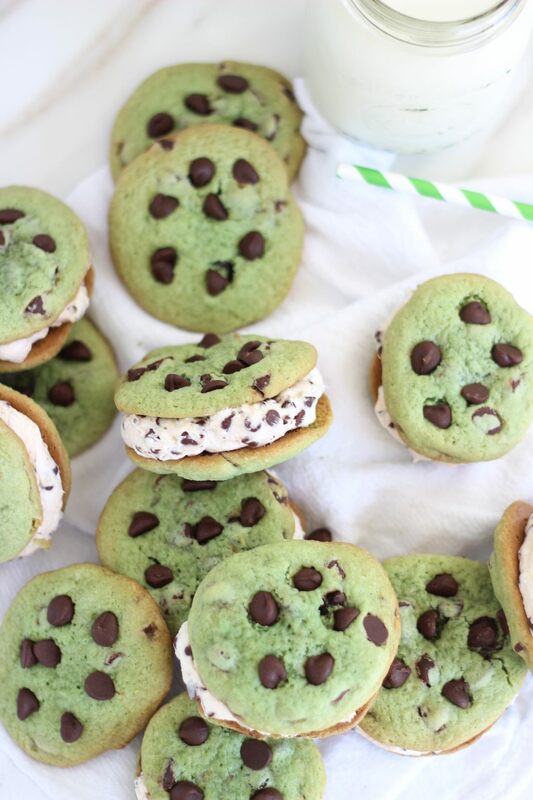 And that will include all the mint chocolate chip and St. Patty’s-ish things! 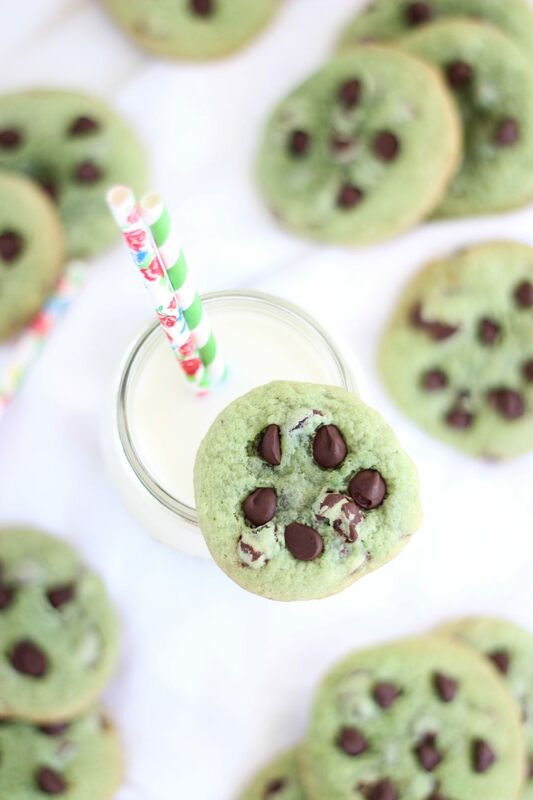 I’m not a snob when it comes to using the basic Tollhouse chocolate chip cookie recipe – I really love that original recipe! 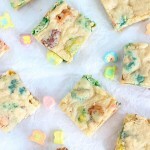 However, there are a few slight tweaks that can make it just so much better if you are a ‘soft and chewy’ cookie-person. Who isn’t? Everyone is clamoring to find the VERY BEST ‘soft and chewy’ cookie. I don’t know if I’ll ever quit searching for it either, but these are damn close. If the traditional Tollhouse recipe is adjusted by starting with the butter melted, adding more brown sugar than white, including an extra egg yolk, plus thorough dough-chilling, then this recipe is golden in terms of providing an excellent soft and chewy, thick, buttery, and rich chocolate chip cookie. 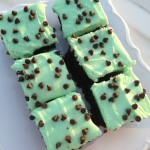 From there, it was pretty easy to customize it into a mint chocolate chip variety! 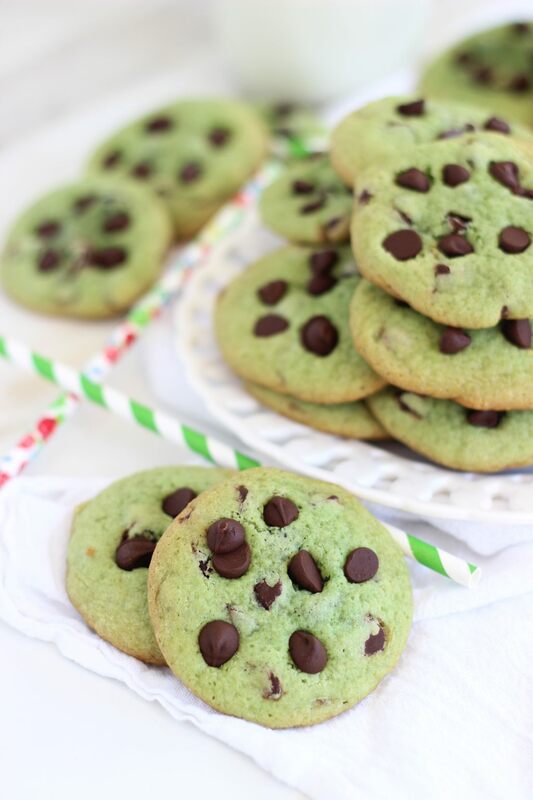 Tint it green, add mint extract, and boom: mint chocolate chip. So easy. I sandwiched two cookies with my favorite chocolate chip cream cheese frosting, the one that I used in this incredible Red Velvet Brownie Torte. The fluffy cream cheese frosting, studded with mini semi-sweet chocolate chips, is the perfect tangy and chocolate-y filling for these cookies! 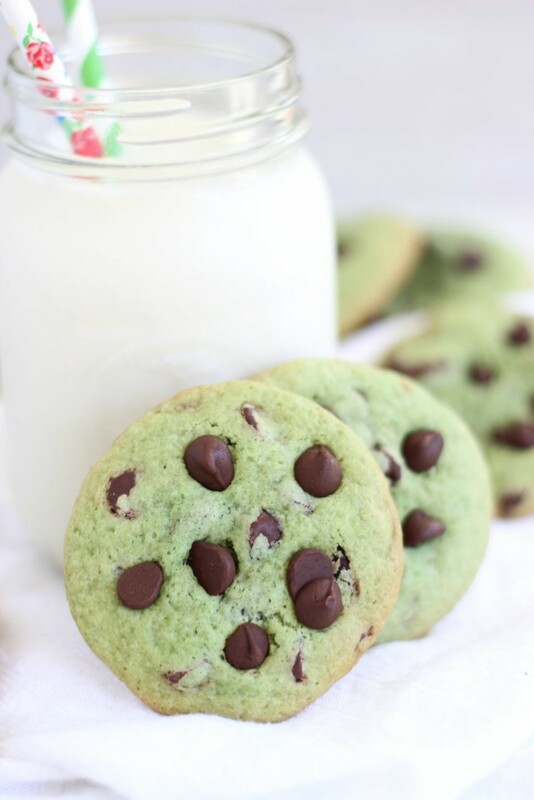 In a large mixing bowl, combine butter, brown sugar, sugar, egg, yolk, vanilla extract, mint extract, and green food coloring, beating until blended. In a medium bowl, combine flour, baking soda, and cornstarch. Add the dry ingredients to the mixing bowl, and beat until combined. Fold in 1 1/2 c. chocolate chips, reserving 1/2 c. for pressing into the cookies after baking. Chill in the refrigerator for at least 2-3 hours. Roll dough by tablespoonfuls and place onto parchment paper or silicone mat-lined baking sheets. Try to make the dough tall cylinders so they bake thick. Bake at 325 degrees for 10-12 minutes, or until the centers are just set, and the edges are golden brown. Remove from oven, and press 4-5 chocolate chips onto the top of each cookie. Allow cookies to cool on the pan for 10 minutes before before removing to wire racks to cool completely. In a large mixing bowl, beat cream cheese and butter til smooth. Add powdered sugar, and beat until light and fluffy. Spread a heaping tablespoonful of frosting on the bottom of one cookie, and top with another cookie. Enjoy! 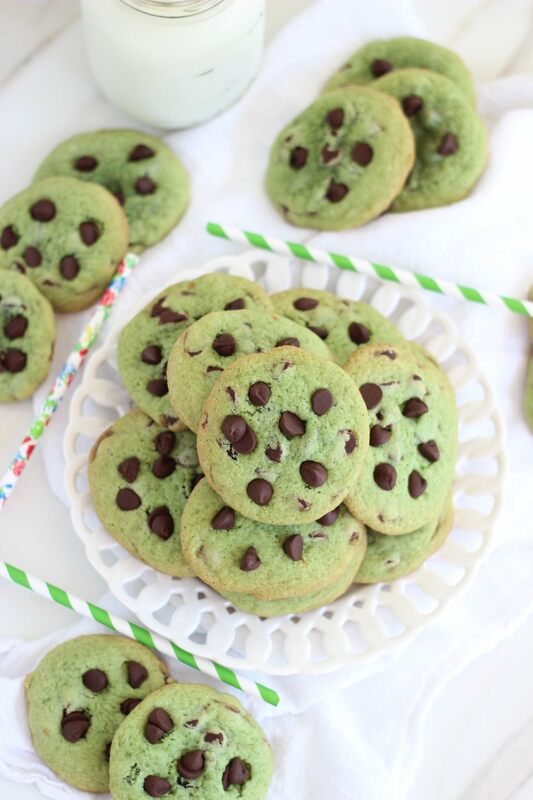 My Mint Chocolate Chip loving boys will adore these. Thanks for sharing on Creative K Kids Tasty Tuesdays. I hope you will party with us again next week. Um, wow. 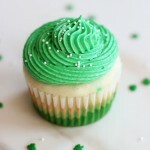 I’m bummed I didn’t see these before St. Patty’s day. They look delicious! Looks super yum! Need some fun occasion (or not) to make these. Visiting from Create It Thursday. 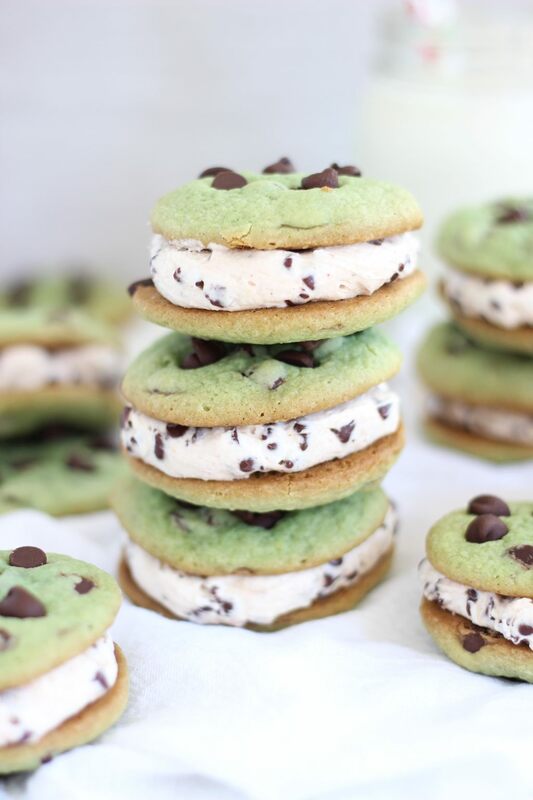 love mint and as a sandwich cookie too, heck yes! 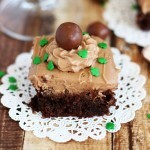 How fun are these and I love love love chocolate and mint! Thanks for sharing on Throwback Thursday! Thanks for bringing these to Foodie FriDIY!